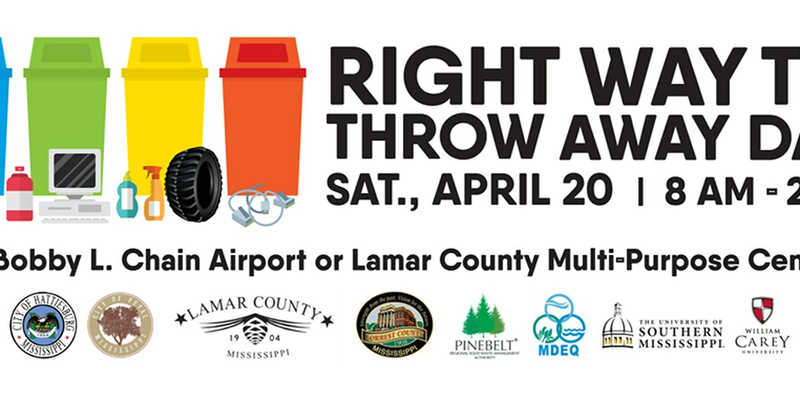 HATTIESBURG, MS (WDAM) - The City of Hattiesburg is partnering with several government and community agencies to host its annual ‘Right Way to Throw Away Day’ on Saturday, April 20. The purpose of this event is to prevent different types of chemicals and products from getting into the soil and water. Residents can drop off their hazardous waste at the Bobby L. Chain Airport, located on Academy Drive in Hattiesburg, or the Lamar County Multi-Purpose Center, located on 99 Central Industrial Row in Purvis, from 8 a.m. until 2 p.m. for proper disposal. Ammunition, explosives, medical waste, syringes, radioactive materials and polychlorinated biphenyl products will not be accepted.